The University of North Carolina General Alumni Association is pleased to partner with Orbridge to offer our alumni exceptional travel opportunities—a combination of exclusive itineraries, deluxe properties or ships, knowledgeable expedition leaders, and the company of fellow alumni. With special features and unparalleled access to distinguished locations, you will discover unforgettable places, people, and cultures, and enjoy experiences that will enrich your understanding of our diverse and wonderful world. Whether close to home or far away, on land or by sea, your next adventure is waiting! 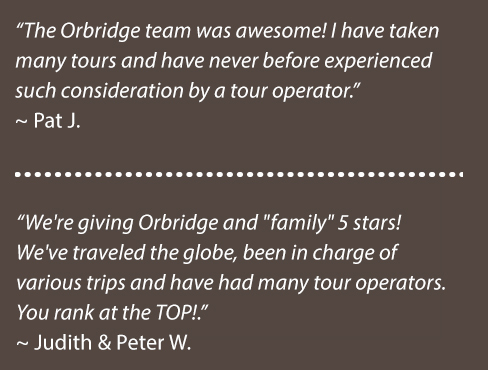 Join us and our partner Orbridge—make your reservation today!